Dough located in Brookyln, NYC has some very delicious donuts. They recently opened up a shop in the Chelsea area in Manhattan. The line was literally wrapped around the block everyday for the first week it opened. Yes, I stood in line for 30 mins to try these tasty artisanal treats. 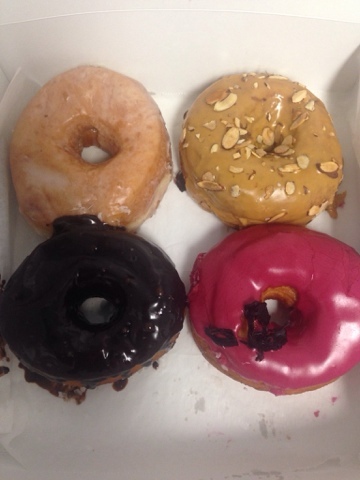 I decided to try the chocolate salted caramel, dulce de leche, hibiscus and a regular glazed. These donuts were AMAZING!!! my favorite was the chocolate and dulce de leche! They are a bit sweet, so if you want a subtler taste, then go for the plain glazed. These donuts are so light and fluffy, I can't wait for my next visit to Dough.